In an era where Marvel and DC are spending most of their time and resources duking it out for supremacy at the box office, it may be hard to believe that it wasn’t that long ago the Big Two had quite a run of crossovers between their respective super hero universes. The 90’s gave rise to crossovers such as Batman/Daredevil, Batman/Punisher, Batman/Captain America, Batman/Spider-Man…hmm…I guess they should more accurately be called Marvel and Batman crossovers. Prior to that 90’s boom however, the crossing over of characters between the two companies was few and far between. After the break we’ll look at two of those starring the two companies biggest hitters (apologies to Batman): Superman and Spider-Man. As usual, spoilers follow from here on out if you’ve missed out on the last 50 years of Spider-Man and are just getting started. These inter-company crossovers generally take two forms. The first type would involve a story device of some kind that would allow the bridging of the two worlds. This would be most evident during the mid-nineties when Marvel and DC appeared to be new best friends and published several Marvel vs DC mini-series that would pit characters from each company against the other and often times allowing the fans to vote for the winner. This was made possible by the reveal of two Gods, one from each universe, that discovered each other and because comics, challenged each other to the contest, with the losing universe being destroyed. This of course led to the creation of an entirely new line co-owned by each company: Amalgam Comics. These event books interrupted the regular schedules at both Marvel and DC and consisted of characters from each universe being mashed together. 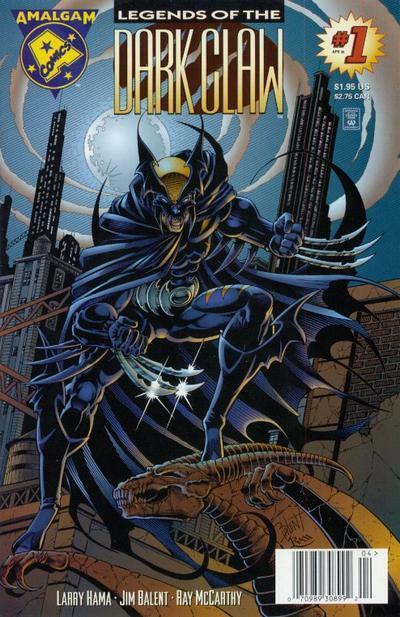 For example, Wolverine + Batman = Dark Claw. Dark Claw has proven popular enough to even garner rumors of a feature film. Don’t hold your breath. This is a typical Jimmy Impossible long rambling way of saying that these stories made it very clear that there is a Marvel Universe and a DC Universe and it takes a noteworthy event to bring the two worlds together. The other common approach that has been taken is to set the story in a world where the Marvel and DC characters co-exist. But in doing this, the stories can immediately be removed from official continuity. Especially on the Marvel side of things where cities like Gotham and Metropolis do not exist. There is a New York City in the DC Universe, but it is not crawling with Marvel super heroes. 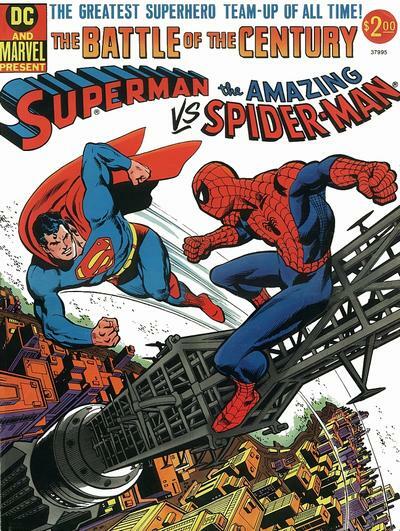 In January of 1976, Marvel and DC historically crossed over for the first time in Superman vs. The Amazing Spider-Man. 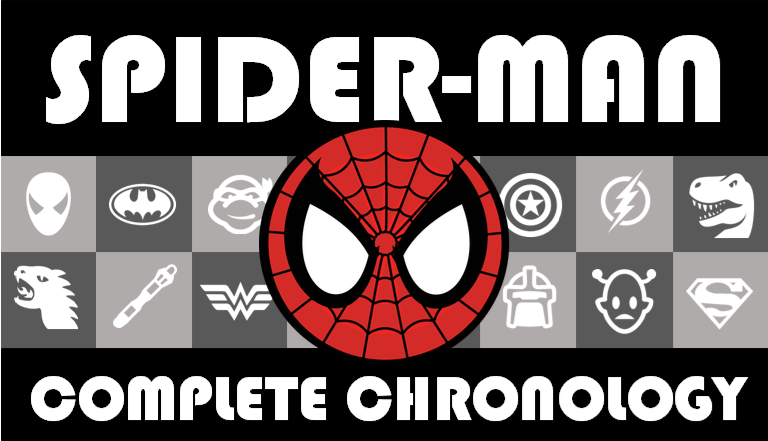 The story featured a world where Marvel and DC characters co-existed, so for the purposes of the Spider-Man Chronology, it just became invalid. I haven’t read much Superman from that era so I can’t comment on him, but writer Gerry Conway clearly worked in several references to the current goings on in Spider-Man’s life. He is in college and dating Mary Jane. Betty Brant and Ned Leeds are married and just back from Paris. There are many clues that could be used to attempt a placement in the chronology…except for pesky things like Peter meeting Lois Lane and both of them being familiar with the others work. Or Lex Luthor and Doctor Octopus having knowledge of each other. The meeting of Superman and Spider-Man strains the limits of suspending disbelief in this situation. Both of these heroes have been around for years on this world and have never run into each other before? Lois and Peter seem to know more about each other than Spider-Man and Superman do. But let’s not pick the book apart like that. It’s a fun issue, though quite clearly set in the pre-Crisis Superman mindset. For example, Spider-Man and Superman are attempting to hack one of Luthor’s computers. For some reason Spider-Man’s spider sense doesn’t warn him that it is booby trapped. Luckily Superman sees the trap in time using his x-ray vision and saves Spider-Man, but not before the computer explodes. Supes and Spidey need the computer for reasons, so what are they do do now? No worries, Superman uses his super speed, super memory and super engineering skills to completely put the computer back together exactly as it was. Because, you know, an explosion would not damage any of the components, only scatter them around over a short radius. There are a few bits of what we few now as silliness throughout. 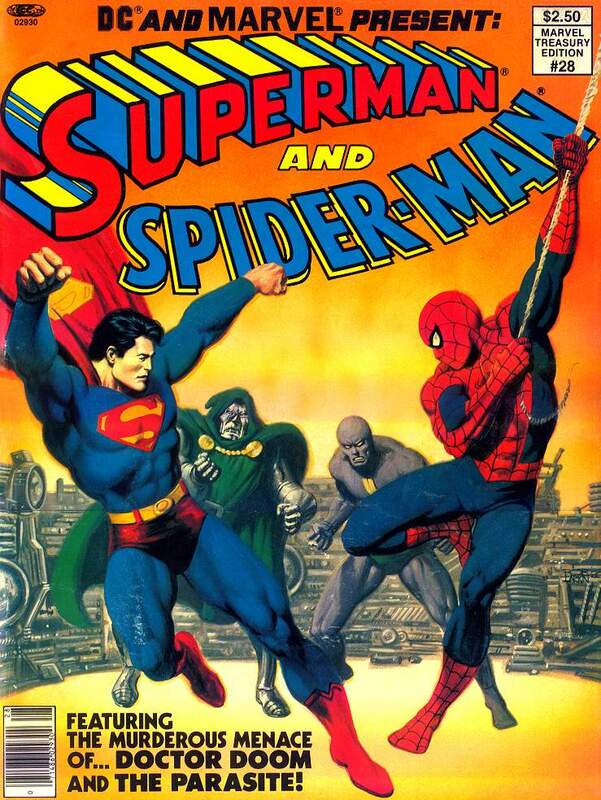 In 1981, Marvel and DC decided to try it again, publishing two crossovers: Batman vs The Incredible Hulk and Superman And Spider-Man. I guess they decided to drop the “vs” since Supes and Spidey had previously met and already got the requisite “super heroes fight when they first meet before becoming friends and teaming up” out of the way. This go round Peter Parker and Clark Kent essentially end up trading places as Peter moves to Metropolis to work for the Planet and Clark moves to New York to work for the Bugle. They are both investigating some strange goings on which inevitably leads to them teaming up against Dr. Doom and Parasite. And since this is a sequel of sorts and has to be bigger and better, Superman versus the Hulk and Spider-Man versus Wonder Woman fights are thrown in for good measure. The story is not as corny with the medium having aged 5 years since the first crossover, but it still had it’s moments. Like Clark Kent getting out of a staff meeting by using his power of “super ventriloquism” to make people believe someone was crying for help out in the hallway. Really? That said, this story is not near as fun, even though they both deal with madmen trying to take over/destroy the world. So while for the purposes of the chronology these two books are obvious exclusions, they are definitely worth your time to pick up. Especially since both are printed in the oversized “treasury edition” style that makes them just that much more awesome. Be on the lookout for further updates coming soon. And you will always be able to find the Complete Chronology in it’s permanent home under Big Projects in the menu under the Gabbing Geek banner. DC and Marvel in the 70s used to tease each other a lot in a fairly friendly way. JLA and Avengers actually had a pair of Halloween issues one year where the Avengers and the Justice League both went to the same town and fought different menaces. Watch the parade at the end of each issue, and you can see the other team on a different float in the background. In that case, the writers of both books were friends and were having a bit of fun referencing each other’s work. Likewise, the Squadron Sinister and the Champions of Angor both appeared around the same time, where the Avengers battled the League-like Squadron and the League took on the rather Avengerish Champions. That’s not even getting into the time honored Marvel tradition of drawing Clark Kent into crowd scenes, perhaps looking as shocked and surprised as everyone around him. Clark and Jimmy Olsen have shown up in random issues of Amazing Spider-Man from the late 70’s, early 80’s. I spotted Clark and Lois in a courtroom scene in Fantastic Four once. That was probably in the 90s. I remember a Spider-Man issue where Clark and Lois were being rescued by the New Warriors in a blizzard during their honeymoon. Jim Valentino drew Clark and Jimmy into a crowd scene for an issue of What If when the Avengers, not the FF, were the ones who had to defeat Galactus. It happened all the time.